Funeral Mass for Mary B. (nee Bour) Arndt, 96, of Mentor, will be 10:30 a.m. Friday at St. Mary Magdalene Church, 32114 Vine St., Willowick. Mrs. Arndt passed away Sunday, Oct. 14, 2018, at Haven Home Assisted Living in Mentor. Born Dec. 10, 1921, in Cleveland, she had been a resident of Lake County for 30 years. Mary was a member of St. Bede the Venerable Church and the Baker’s Union, having worked at Sherwin’s Bakery. She also enjoyed crocheting. The family would like to thank the caregivers at Haven Home Assisted Living in Mentor for the love and care they gave their mother. She was the loving mother of Carol M. Maxwell, James W. (Evelyn) Arndt, Richard J. (Cheryl) Arndt, Janet M. (Mark) Dannemiller, Patty R. Jackson and Raymond H. (Karen) Arndt; cherished grandmother of 15; great-grandmother of 21; and aunt of nieces and nephews. Mary was preceded in death by her beloved husband, Harold W. Arndt in 2011; sons-in-law, James “Bill” Maxwell and Frank Jackson; parents, John and Caroline (nee Sterf) Bour; and siblings, John (June) Bour, William (Helen) Bour and Charles (Rosemarie) Bour. Family will receive friends from 4 to 8 p.m. Thursday at The Abbey of Willoughby, 38011 Euclid Ave. (located on the grounds of McMahon-Coyne-Vitantonio Funeral Home), in Willoughby. Burial will be in All Souls Cemetery in Chardon Township. Contributions in her name may be made to Hospice of the Western Reserve, 17876 St. Clair Ave., Cleveland, OH 44110. 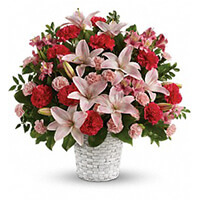 To send flowers to the family of Mary B Arndt, please visit our Heartfelt Sympathies Store. Sending my sincerest condolences to your family. No doubt this is a troublesome time. In the Bible , God is mentioned as the god of all comfort. (2 cor 1:3,4). God invites you to share your innermost thoughts to him through the gift of prayer. This will help you to endure this trial. Rest assured your family member is in Gods memory. My thoughts and prayers are with the family at this time in need. Mary- You were a great Aunt. I will always remember the long weekends on Lander Road and your cherry strudel. You will be missed.